The "Fantastic Worlds: Science and Fiction, 1780-1910" exhibit features examples of science fiction literature and explores how developments in science influenced fiction. 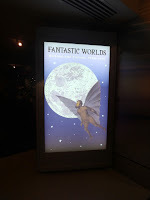 It was interesting how it was organized by chapters with each featuring some examples of different types of science fiction, such as Chapter 1: Terra Incognita about unknown lands and Chapter 5: Rise of Machines that included Tik Tok from the Oz books. Mik particularly enjoyed looking at the various illustrations that were on display.